When Sonic woke up once a day, he decided to take a walk in his beautiful world without his wife knowing it. But suddenly he saw a blue spinning circle above his head. He jumped in it and found himself in Sonic in Mario World, and then he began his journey. In this adventure game, the rule is the same as what is in Mario games. You need to collect coins, mushrooms, and you should avoid other animals such as turtles. You’d better not fall into the water or you will lose one of your lives. Try to get as many points as you can. Enjoy yourself on www.bestgames.pk where this game is belonged. Mirror, mirror on the wall, who’s the prettiest of them all? There is only one way to find out! 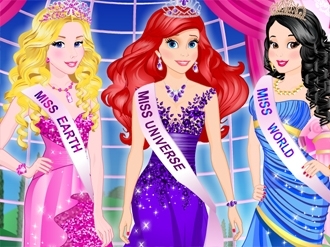 Join three Disney beauties at the one of the greatest beauty pageant contests. Help them to get ready for the pageant through a fabulous dress up, that will make every of three princesses feel absolutely special! Too many ruffles? Too much sparkle? No such thing! Use your fashion sense and choose the perfect outfit, hairstyle and accessories. And then you can feel yourself as the juryman! There is three nominations - miss earth, miss world and miss universe! Who is going to get the first prise? Play free game Super Marioworld Revived on bestgames.pk.